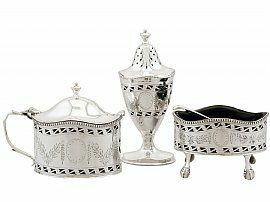 This exceptional vintage Elizabeth sterling silver three piece condiment set consists of a salt, pepper pot and mustard pot. 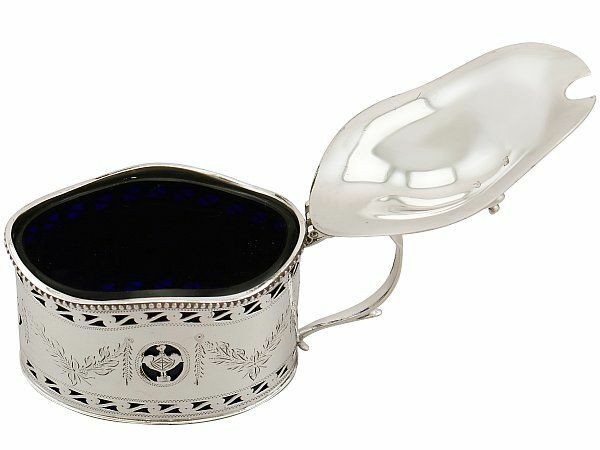 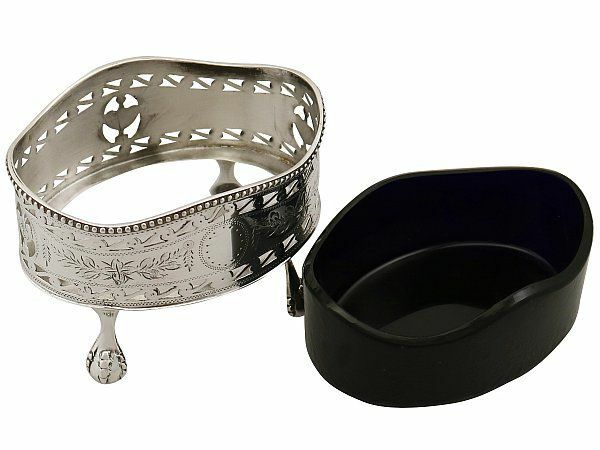 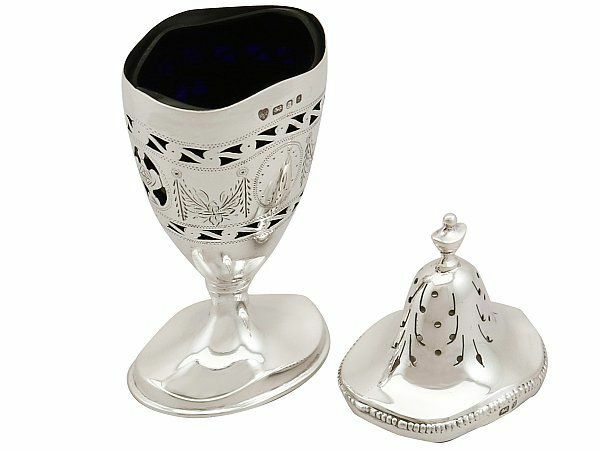 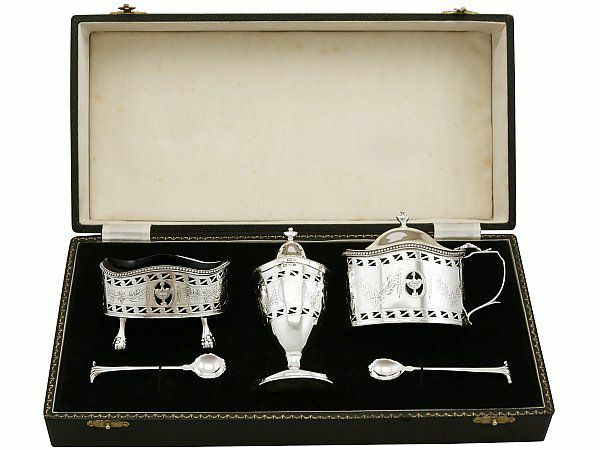 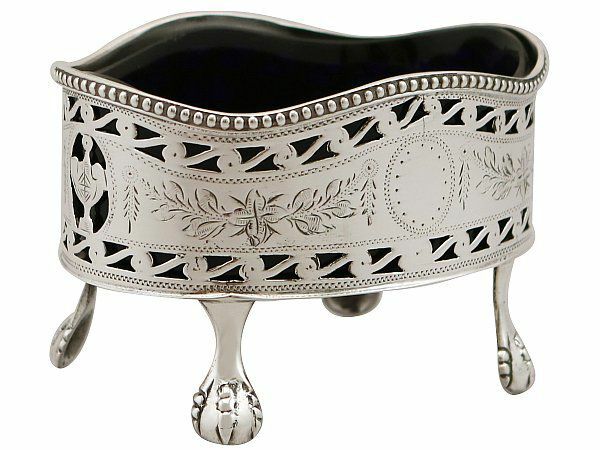 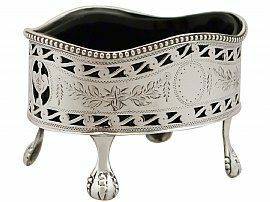 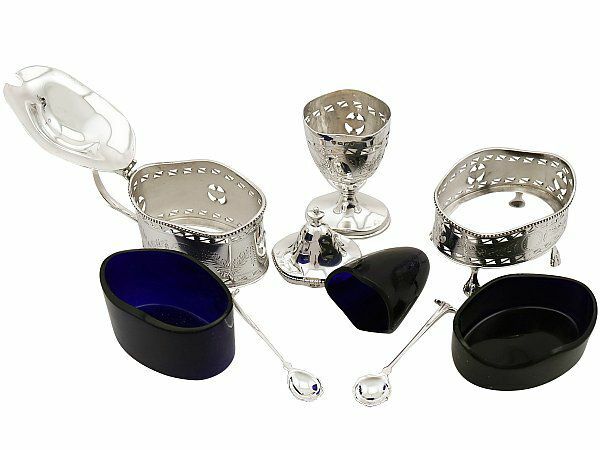 The pieces of this fine silver condiment set have an oval shaped form. 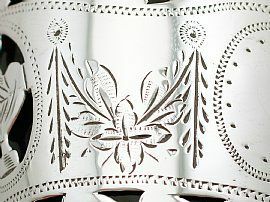 The surface of each piece is encompassed with two pierced decorated borders accented with scrolling motifs, in addition to central engraved foliate festoon designs. 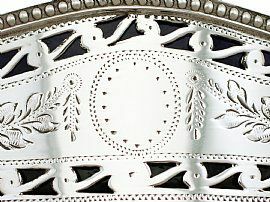 The decoration to the each body incorporates a vacant oval cartouche to one side and a pierced decorated urn motif to the other. 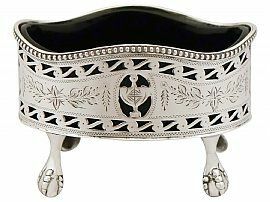 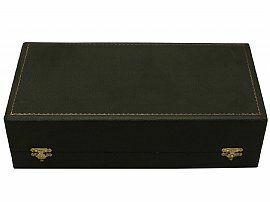 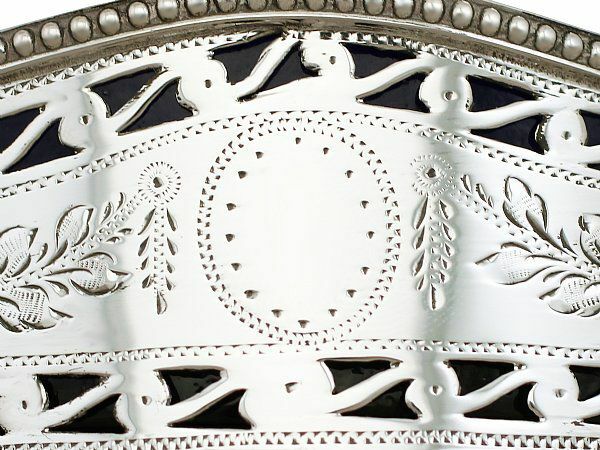 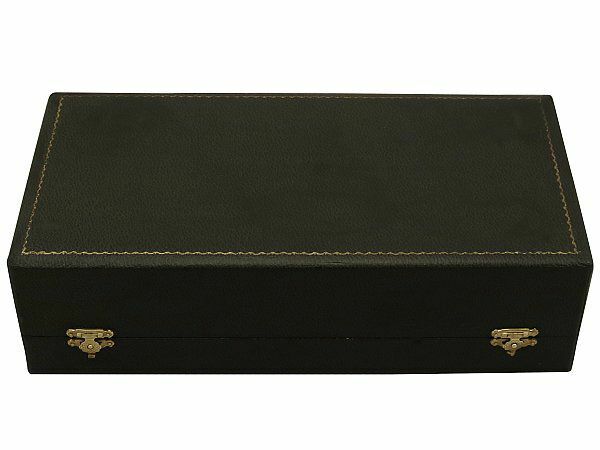 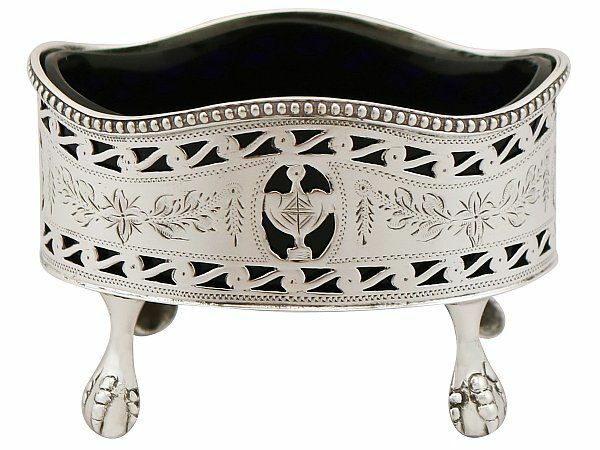 The upper rim of each piece is ornamented with an undulating applied bead decorated border. The mustard pot is fitted with a scrolling C shaped sterling silver handles with a plain elevated thumpiece. 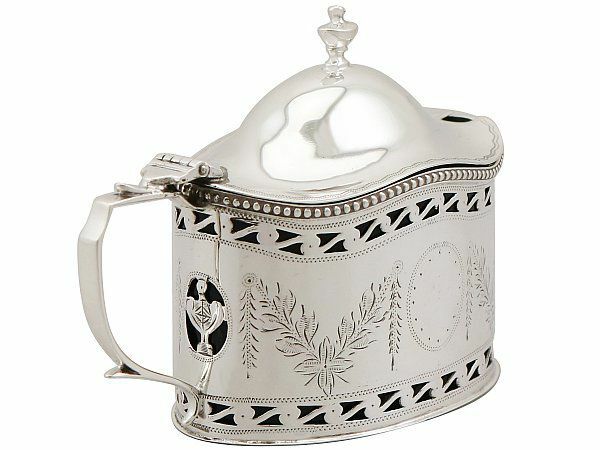 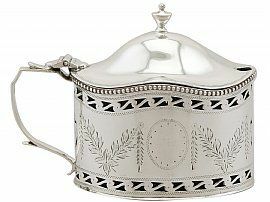 The mustard pot has a hinged hallmarked plain domed cover. 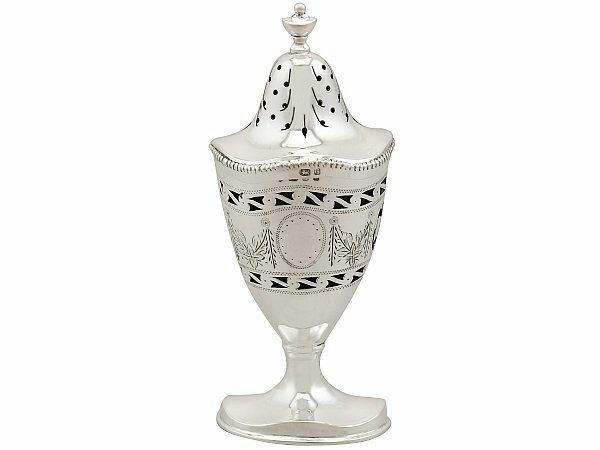 The pepper pot is fitted with a push fit hallmarked domed cover with pierced 'pepper' holes. 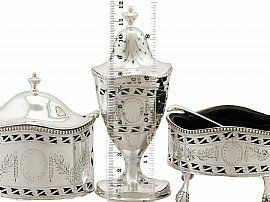 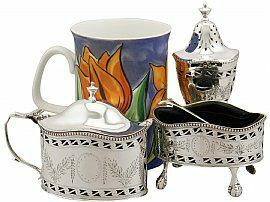 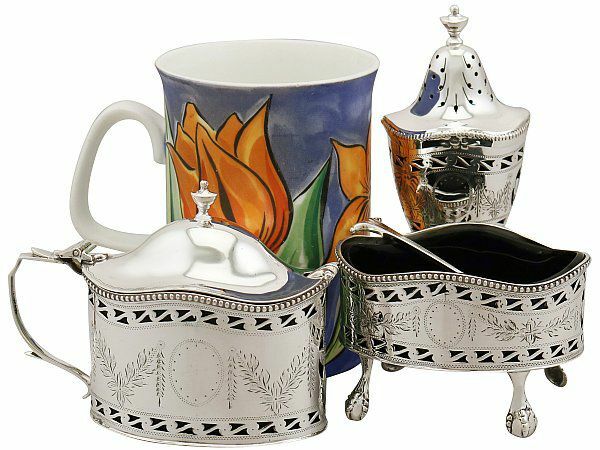 The covers to the mustard pot and pepper pot are surmounted by sterling silver classic urn style finials. Each salt and mustard pot is fitted with the original, removable blue glass liner. 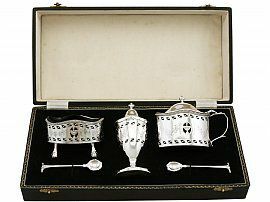 The set is presented with the an Onslow pattern mustard spoon and salt spoon. This vintage silver condiment set with blue liners is fitted to the original hinged leatherette box with satin and velvet lined interior and secures with two hinged catches. 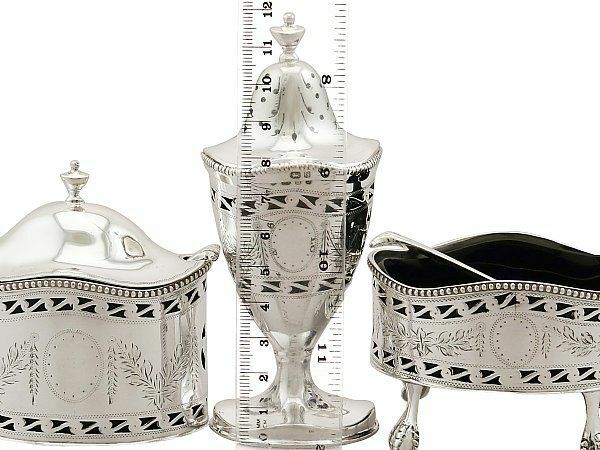 The pieces of this vintage sterling silver condiment set are an exceptional gauge of silver, exceptional quality and in exceptional condition. 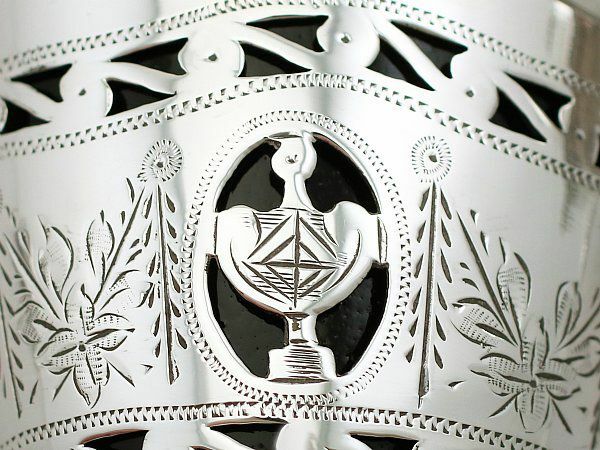 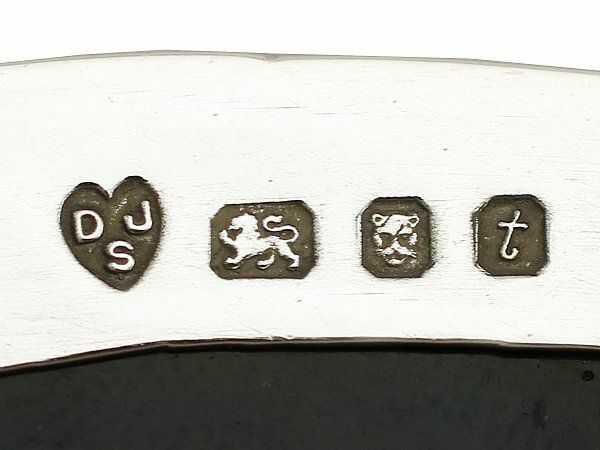 The applied and pierced decoration is all very sharp and the engraved decoration is very crisp. 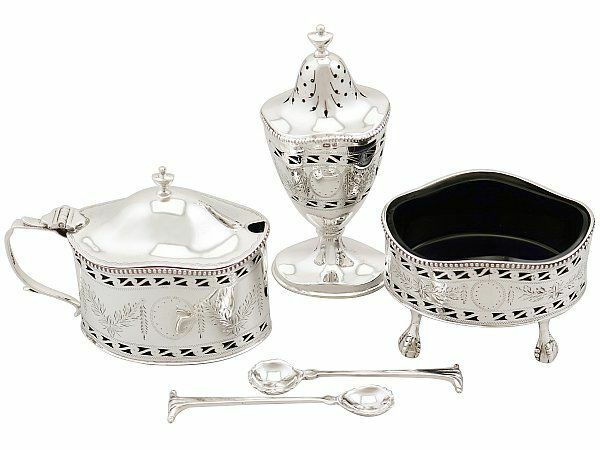 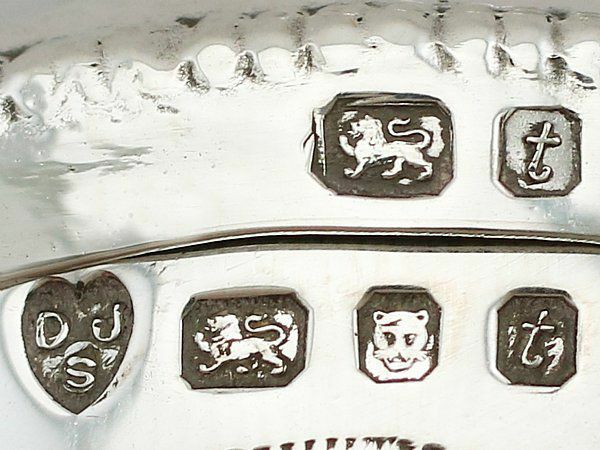 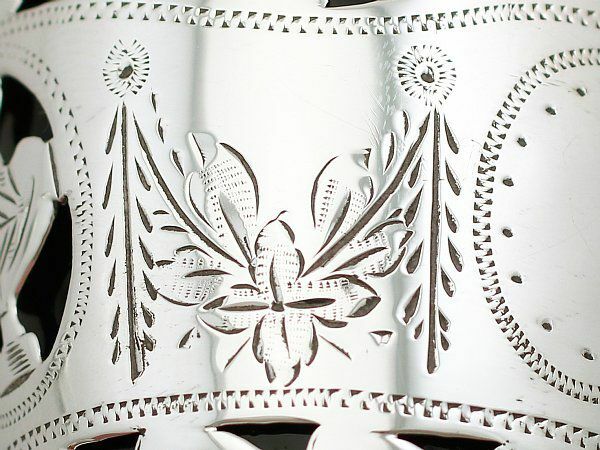 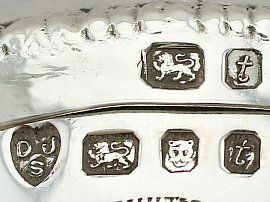 Full hallmarks struck to the surface of the pepper and underside of the mustard and salt, in addition to the reverse of each spoon and part hallmarks to the covers are all very clear; the hallmarks are struck deeply due to the exceptional gauge of silver. 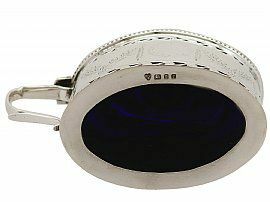 Length from back of handle to rim 10.6cm/4.2"